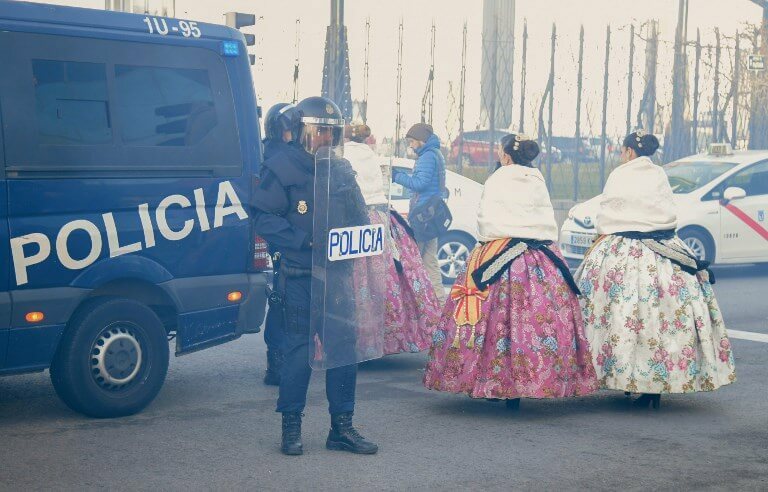 The taxi strike in Madrid continued in full-force this morning, coinciding with the first day of the global International Tourism Fair (FITUR) being held in the capital. Participants arriving at the entrance of the congress centre IFEMA were greeted by taxi drivers burning garbage during a demonstration. Access roads to the centre had also been blocked. 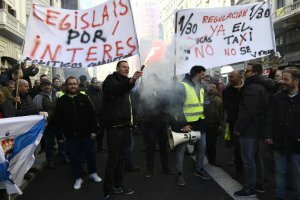 On Tuesday, a taxi driver protesting in Madrid against Uber-like services was seriously hurt after colliding with a car as the strikes continue in the Spanish capital and Barcelona with occasional clashes. He ‘is in very serious condition,’ a spokeswoman for Madrid’s La Paz Hospital told the AFP news agency. Emergency services in Madrid tweeted that the man, in his thirties, had suffered a brain injury. The accident took place in Madrid during a protest by taxi drivers who blocked off a highway on Tuesday afternoon. The drivers in the city started an indefinite strike on Monday in protest at competition from ride-hailing services such as Uber or Cabify, also known as VTCs (Tourism Vehicles with Chauffeur). Footage broadcast by Spanish media showed the taxi driver, wearing a yellow vest like anti-government protesters in France, jump onto the bonnet of a black vehicle surrounded by demonstrators. He fell heavily onto the road as the vehicle sped off, pursued by protesters. The Guardia Civil police force told AFP the driver of the vehicle involved in Tuesday’s accident had turned himself in and was questioned before being released. However the Guardia Civil refused to say whether the car was a VTC, as claimed by the taxi drivers. There were also clashes in Barcelona, where taxi drivers have been on strike since Friday. Unauto VTC, the association representing the sector, said 80 VTCs had been damaged in Barcelona and 50 in Madrid during the strike. On Monday, taxi drivers in Barcelona tried to force their way into the Catalan regional parliament but were held back by police. Spanish taxi drivers complain that rival drivers from ride-hailing apps compete unfairly since they do not face the same regulations and costs. In Barcelona, they are also angry about new regulations unveiled Friday by Catalonia’s regional government obliging VTC clients to book their services at least 15 minutes in advance. That means Uber or Cabify users would have to wait 15 minutes before they get a ride. But taxi drivers argue that ride-hailing services are not a taxi service by law and should therefore be booked 12 to 24 hours ahead of time. Catalonia’s regional government met with representatives of the taxi drivers on Tuesday and unveiled a new proposal. A spokesman for the taxi drivers told Spanish public television that under this new proposal, Uber or Cabify customers would have to book at least one hour in advance..
A VTC representative quickly threatened to withdraw from Barcelona after the Catalan government’s proposal. ‘Unfortunately, the Generalitat (Catalan executive) has decided to yield to the taxi sector’s blackmail and we are forced to convey that the VTC services will have to leave the city of Barcelona,’ Cabify representative Marta Plana told the media.